These are amazing! You will want to make these all the time since they are so simple! In a heavy Dutch oven, heat oil to 400 degrees F(use a thermometer to keep the temp right!). 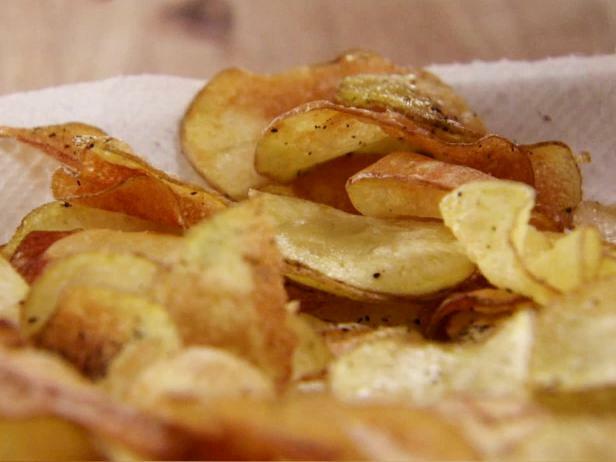 When it's hot enough, lay the potatoes on baking sheet lined with paper towels, and blot them with more paper towels to dry. Lower batches of potatoes into the oil using a spatula. They will fry very quickly; stir with a heavy metal spoon as they fry to get them to be the "kettle" style. Remove with a slotted spoon when they're nice and golden and crisp, about 5 minutes. Immediately sprinkle on salt and lots of black pepper. Repeat with the rest of the potatoes! Serve very soon after frying.